DB starting off with definitions in that document… “principals/restrictions” on staffing… (i.e. give consideration for minorities, bilinguals; hire aged 18+; don’t hire family members). DB: If you meet those, then it’s at your discretion? SM: Yes. DB: If a Senator has an outstanding research need that’s specific -- like a speech written that isn’t going to take a couple of months, or website expertise short term -- he can do this without a contract. SM: Yes. You’re right, Senator can submit invoices without contract to be paid, and it’s accepted with a certification document. However, I don’t recall exactly if this was after 2008, Senator were advised that best practices is whenever they need a service, to send a request to prior to services starting. DB: Where? Where is this written? SM: I think I saw this in an internal economy document yesterday. DB: As you said before, neither HR or Senate Finance, once the invoice is submitted for payment, there’s no inquiry for what services were rendered. DB suggesting there’s more control over contract amounts since 2011 (if contract gets amended, the amount can only go downwards). SM agrees. And we'll be back at 10 a.m.
Crown lawyer Jason Neubauer begins re-examination: Good morning Ms. Makhlouf. Almost done. (Makhlouf chuckles). JN who does the senate rely on to make sure the work is complete? JN How does Senator assure that work is complete? JN Does senate go behind the signature and question the truth of the Senator's assertion that work on contract is rendered? JN If they want to change the services contractor is doing, how do they do that? JN: What impression do you have on who specifically would be performing the work? JN What impression did it leave you, who would be doing the work? JN shows Chapter 5 and 6 of Senator Resource Guide. (Bayne objects that Neubauer shouldn't be going through a document related to Finance with Makhlouf. $500 for seven months. it was very modest, wasn't a lot of money? Bayne: Duffy's popular. Mail is important to parliamentarians, important service to EA, opening and sorting mail, responding? Bayne: Not different than what you're doing with the PM now? Bayne: Are you aware of stories in news of young interns being advantage of? 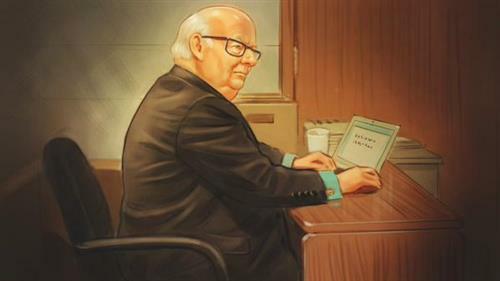 Bayne: No suggestion the $500 was personal benefit to Duffy? He didn't ask you to cash it and give him half back? Cain says discussion about payment via email with Duffy and his assistant. Bayne asks Cain why she works at Duffy's office: "I really enjoyed going and I had a good professional relationship with Melanie"
Bayne pointing out if Cain asked if there was opening for full time work. Cain says yes. Make up artist Jacqueline Lambert is next crown witness. "Yes" - provided make up services after appointment in Senate - "Twice"